Biotin is part of a group of vitamins called “water-soluble vitamins”. These vitamins are exactly that – soluble in water. 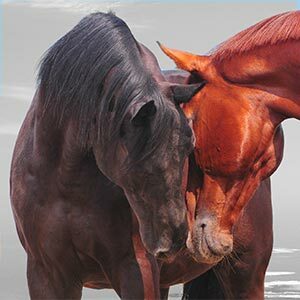 Biotin is the only water-soluble vitamin that has brought about obvious visible changes in horses thought to be perfectly healthy. Sometimes, even when present in the feed, it is unavailable for digestion by the horse. For example, the biotin in wheat, barley and oats is not digestible. But the biotin contained in maize, soya and fresh grass is digestible. The visible changes that biotin brought about occurred mostly in the feet of the experimental horses. Bad hooves are extremely common in domesticated horses. One survey reported that 28% of horses investigated had some type of hoof problem. or separating from the sole. Most of the owners of these horses didn’t know the reason for these problems. Many of these cases responded extremely well to supplementation of 15mg of biotin per day. This is much more than was considered the recommended daily allowance. The horn of the hoof is composed primarily of protein, which is made up of amino acids. This is why a lot of hoof supplements also contain methionine, an amino acid necessary for hoof growth. It is also a source of bioavailable sulphur. Calcium deficiency should also be avoided for optimum hoof growth. It is also essential that the hooves are properly shaped and trimmed on a regular basis (every six weeks). Long, unpared hooves exert excessive pressure on the heels. This restricts blood flow, impeding adequate nutrition of the foot, leading to poor quality and crumbly unsatisfactory growth of walls, sole and frog.